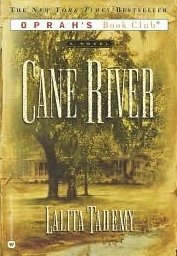 My book group chose Cane River by Lalita Tademy for our January book. This book came out quite a few years ago (2001) and I remember hearing a lot about it when it first came out. Especially since it was an Oprah Book Club pick at one point. The book is split into three parts, each part belonging to one of the daughters (Suzette, Philomene and Emily). I felt that this format worked well for the story. The family trees at the beginning of each section along with family photos also helped piece things together. However, my head hurt by the end of this book. I know this book is based on fact and that Tademy put a lot of research into it, but it was just one pregnancy after another followed by sickness and the loss of a loved one. Weighing in at over four hundred pages, the cycle of life and death became almost too much to bear. I ended up skimming the last quarter of the book and to be honest with you, I don’t think I missed anything. It will be interesting to hear what my book group thinks of it next week. I read this one a while ago, and I don’t remember too much about it, except that I liked it. Ti, I read this several years ago after it first came out and remember that I liked it a lot. Sorry that you didn’t care for it but you may enjoy the discussion anyways. I find that happens in my book club when I don’t care for a book that much..the conversation is always great to hear others perspectives.